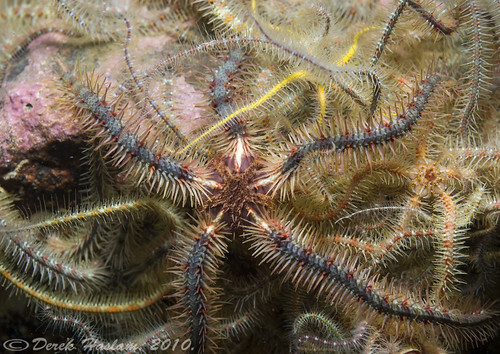 The Echinoblog: Brittle Stars Have TEETH! What do they use them for? 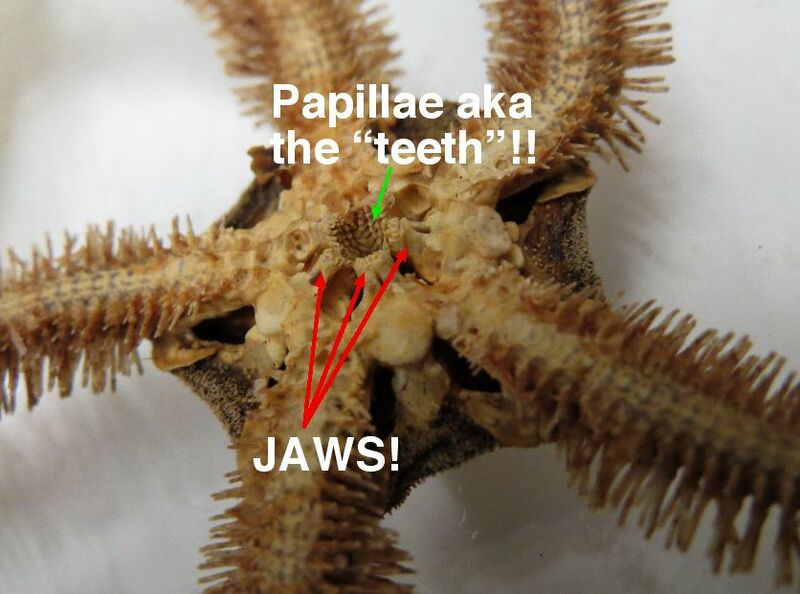 Brittle Stars Have TEETH! What do they use them for? 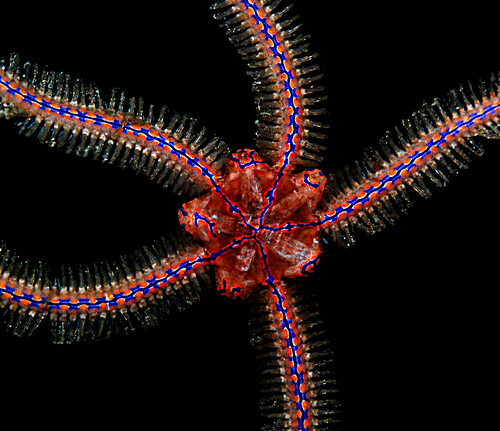 Brittle stars are everywhere. 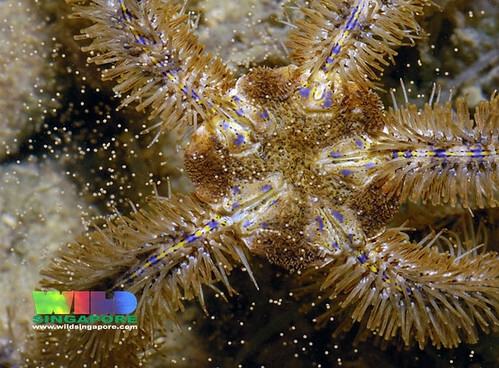 They are the most speciose of all the living echinoderms with over 2000 species (probably MUCH more than that!). At this moment in time, for studying brittle stars we live in a privileged time because we have several new workers who have taken to studying the various and weird lives of brittle stars! 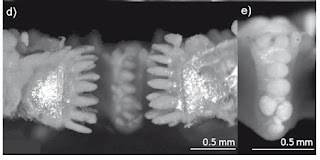 One distinctive feature of brittle stars that researchers that study morphology have always known about are the unusual jaws present on the mouth of brittle stars. 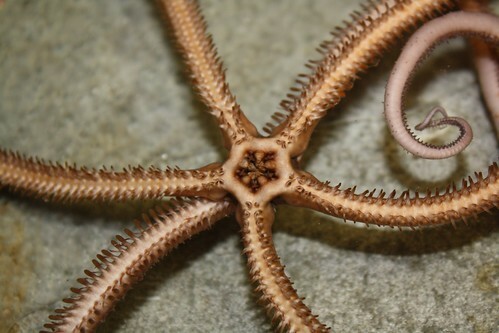 These jaws vary between individual groups of brittle stars. 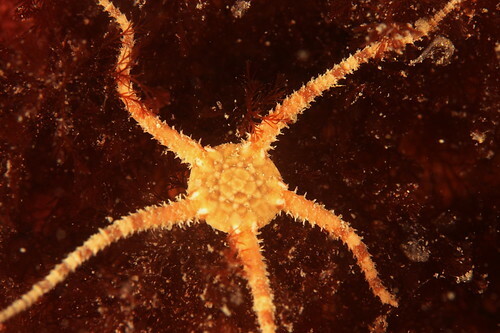 Its one of the fundamental ways that brittle star taxonomists tell them apart. These jaws are superficially similar to the ones we see in other animals in that some of them have "teeth" (called oral papillae) and other features which distinguish them. But other than their usefulness in telling them apart, what function do these "teeth" serve? A recent open access paper by Karin Boos, an author at the 7th European Echinoderm Conference held in 2010 (available here) addresses and discusses how the jaws might function relative to the feeding biology of two European brittle star species. First off, Boos reviewed the feeding modes of two species with fairly distinct jaws and teeth. In life, they hold their arms up into the water and are almost always observed in this position in order to obtain food from water currents. Ophiothrix is a filter feeder. They gather up food on their arms, which is then moved to the mouth via tube feet. The other species studied was Ophiura albida which is more of a generalist. A sort of opportunistic feeder. Sometimes scavenging on dead animals but sometimes feeding on other smaller animals. Each species has a different life mode and presumably the morphology, i.e., the teeth of each species reflects how each individual species lives. A brittle star from a completely different group (ie. family) and with a very different set of choppers! 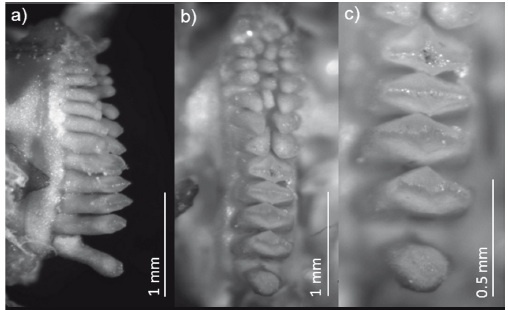 Here is Boos' Figure 1 which shows the two "teeth" types side by side. Ophiothrix on the left vs. Ophiura on the right. 1. Predator? Or generalist? type jaw/teeth in Ophiura. Boos takes some pretty nice profile images (her Figure 2) of the papillae (=the "teeth") that allow her to infer some function. Boos argued that these teeth are in fact "predaceous (=predatory) dental equipment". Note how all of the "teeth" (=the papillae) were pointy. These, Boos argues, are used in gripping or spearing captured prey before ingestion. It doesn't take much to take this consideration seriously. Here is some classic video from Neptune Canada showing what looks like Ophiura sp. fighting it out with another individual over some food. Other related members also have jaws/teeth that sort of look like this. Maybe more of these are more predatory than we thought? Ophiothrix (and related genera of brittle stars) occur widely in temperate AND especially in tropical waters. They can be quite striking and colorful.. Feeding in Ophiothrix is nicely shown in this video. Food caught on the spines, is moved by tube feet along the arm to the mouth, where the food ball, called a bolus is devoured. Ophiothrix and indeed ALL members of the Ophiothricidae are well-known in the taxonomic literature for having these unusually striking types of teeth. Here's a close up! Usually with a very comb-like appearance... MANY papillae (ie teeth) on each "jaw"
From imaging these teeth in profile, Boos notes that the "teeth" are arrowhead shaped and pretty sharp but also pretty wide. Boos states that this combination of "sharp" and "wide" serves to cut up and crush the bolus of food as it enters the mouth. Boos argues that the teeth would also be effective for devouring diatoms and/or grabbing parts of or complete invertebrates in addition to big chunks of scavenged flesh. Boos's efforts are a start. Interpretation of these structures has been surprisingly unseen in the literature. This for example, is an ophiacanthid from the Atlantic..
Has a jaw similar to that of Ophiothrix....kinda. 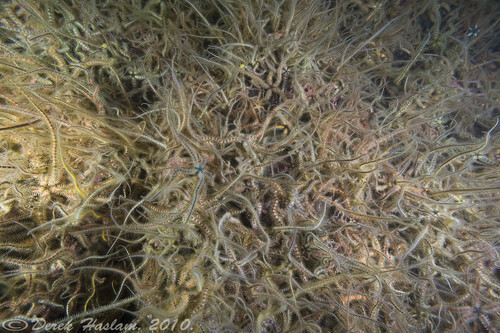 Further data from observations of actual feeding and perhaps even closer observations with x-rays and measurements of brittle star biophysics may give us more insight into how brittle stars feed! b. Get a living specimen feed on a piece of flesh and see the jaws in action by using a high-def cam set on macro. Saturday Night: WHAT is this thing?